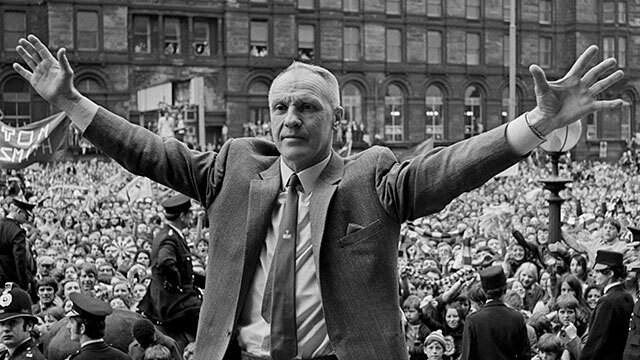 Bill Shankly was born in the Ayreshire mining village of Glenbuck in Scotland. He became a professional footballer with Carlisle United, before moving to Preston North End in 1933. His managerial career began back at Carlisle United, before moving on to Grimsby Town, Workington and then Huddersfield Town. Shankly was appointed Liverpool manager in 1959 and he had a tough job lifting them from obscurity in the second division to first division champions by 1966. As the side of the 60’s declined, shankly brought in new talent – Keegan, Heighway, Clemence and Toshack. Further success followed. The Reds won the first division title and lifted the UEFA Cup in 1973, their first European trophy but certainly not the last. The FA Cup followed a year later before Shankly’s shock resignation at the end of the 73/74 season. Fortunately he had been grooming Bob Paisley to take over at the helm and success was to continue for Liverpool Football Club. Sadly, Bill Shankly died in 1981 after suffering a hear attack. But the legend lives on, and the Shankly Gates stand proud at Anfield to remind fans of the man who made the club what it is.